When it came time to choose my MBA summer project, I struggled to decide among three options: an intensive Art Markets course, an Islamic Finance course, and a Private Equity project. Although the first two sounded super interesting, I decided on the private equity project in order to delve deeper into the nuances of an area that I had become much more interested in over the course of the MBA. The project provided an opportunity to engage in individual research focused on Thesis Based Investing for a private equity firm in Cambridge searching for early-stage growth investments. The point was to identify macro-level themes (big-data, virtual reality, FinTech, etc. ), craft a vision of how the world will look 5-10 years down the road based on/due to those themes, and then select one early-stage company of interest related to those themes. I had previous experience in selecting and valuing publicly traded companies and was curious to see how much of a difference there was in doing the same for private companies. The selection proved harder and the valuation easier (or at least quantitatively less difficult and more of an “art”). For me, the selection was actually the most time-consuming and challenging part of it all. There are so many private companies to choose from and so little publicly-available data that it is hard to know where to start. Along the way I discovered some fascinating tools to help spur the process along and visualize the vast amounts of seemingly-chaotic data out there. The graphics below, for instance (produced from data by Quid), show where private equity and venture capital money has flowed over roughly the past year. 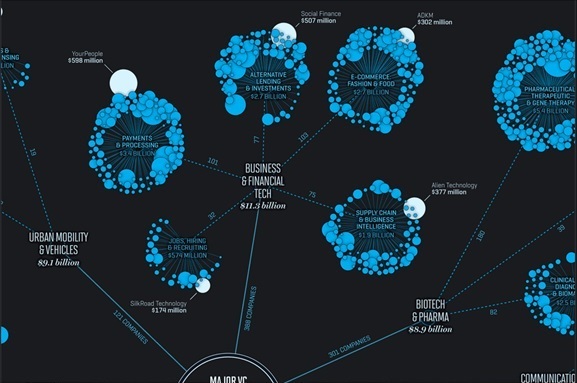 The circles represent individual companies, and the size of each circle corresponds to company valuation. Although these companies are later-stage investments for the most part (and consequently ineligible for my project), a lot can be gleaned from such infographics with a little creativity and close inspection. These and other tools I discovered in the process helped me eventually decide on an investment thesis and ultimately find a company on which to write my report. They’re not one-off discoveries either – they’ll be helpful down the road as well. I learned a great deal conceptually about private equity and venture capital throughout the MBA, but the summer project necessitated I actually got on and did it. Like riding a bike, some things you really don’t understand until you do.